The weather in Charlotte is quite unpredictable. It can be 30 degrees one day and 65 the next. Today was one of those 65 degree days and it was beautiful. 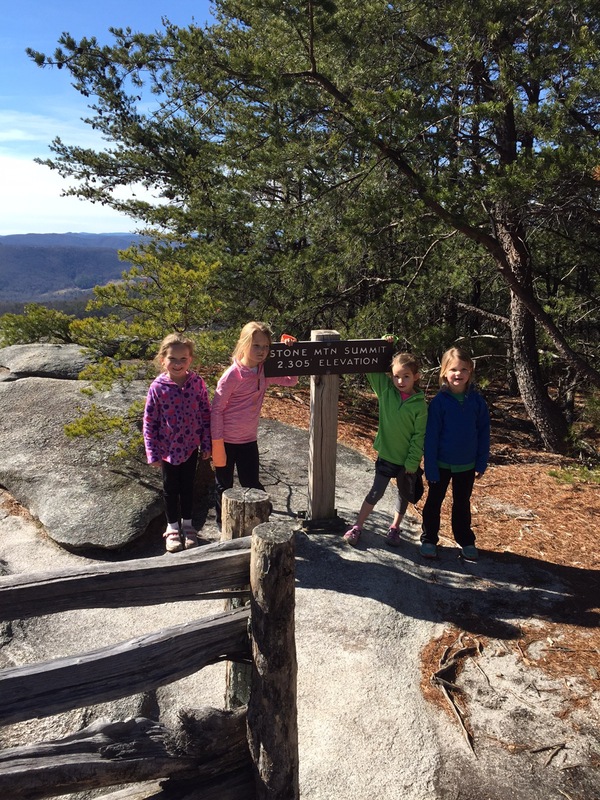 Faith was invited to go hiking with some friends from school up at Stone Mountain. She was gone most of the day, but here is a picture that was sent to us of her and her friends at the top. I needed a day to relax and enjoy the sunshine. It was rejuvenating! 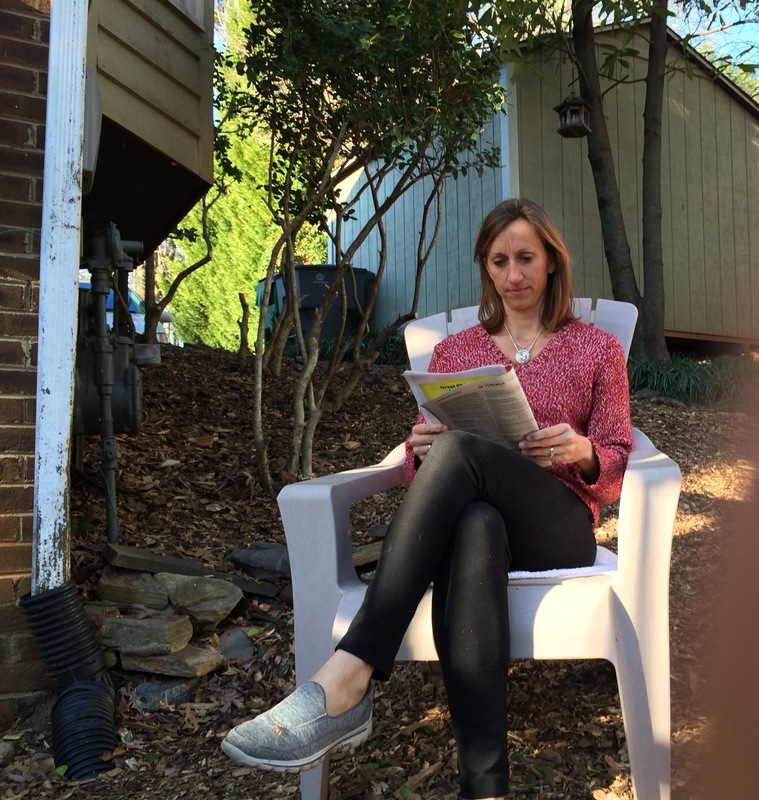 This entry was posted in Uncategorized and tagged saturday, weather on January 31, 2015 by Becca. A few weeks ago we were invited to Kristee and Josh’s house warming party at their new place in the Steele Creek area of south Charlotte. I was not able to go to the party because Tom had the flu and Miller had pink eye at the time. We decided that the best way to see their new house was to drive out there for dinner one night. Kristee and I have been friends for over ten years. She read at my wedding and then Tom and I went to her wedding last summer. Kristee and Josh are a fun couple and I was excited to go have dinner at her new house. Their house was beautiful and just like any newly wed couple, they had more house than furniture. The running joke of the night was that we stood up to eat in the kitchen and the fire alarms were ringing off and on when we first arrived simply due to the heat of the oven. They were gracious hosts – we ate a delicious shrimp dinner, drank good wine, and talked about life and family. 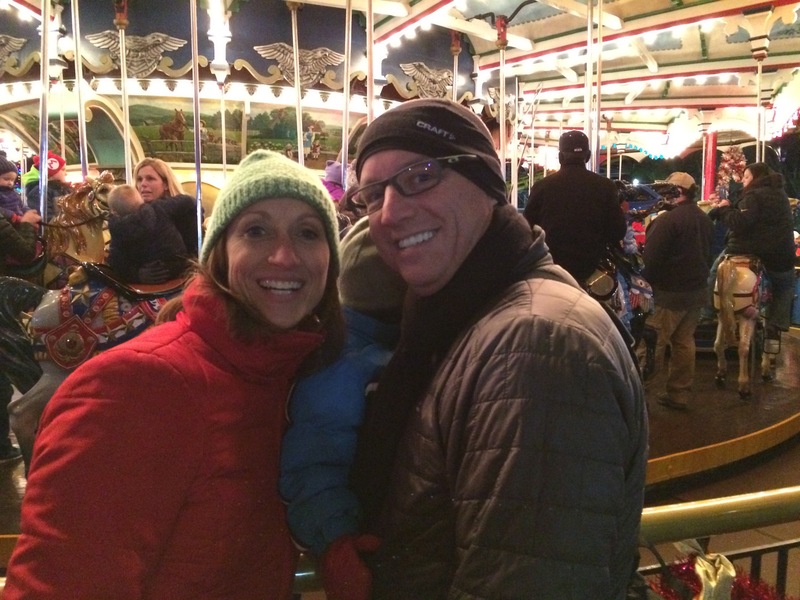 Because they are newly weds and Tom and I have been married for nine years, Josh had some really good questions for us about marriage – what keeps the marriage fun? what allows us to be happily married and not just business partners? Our top five pieces of advice to them was: date nights, counseling, remember your vows, be humble, and keep God first. Marriage is not easy, but if you continue to work at it then it will be enjoyable and lasting. I am thankful for our friendship with Kristee and Josh and I look forward to dining with them again. 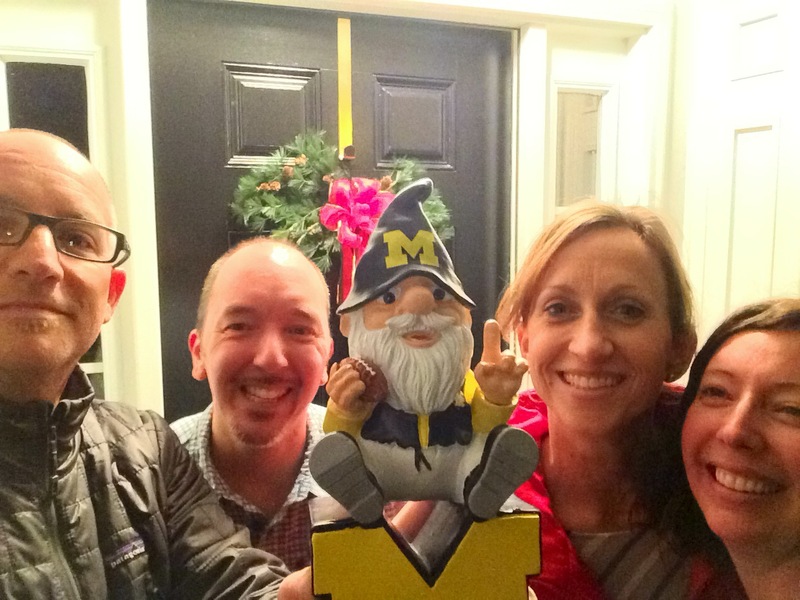 We took a group selfie before we left with the Michigan gnome…. This entry was posted in Uncategorized and tagged bostwick, Dinner, josh, Kristee on January 26, 2015 by Becca. 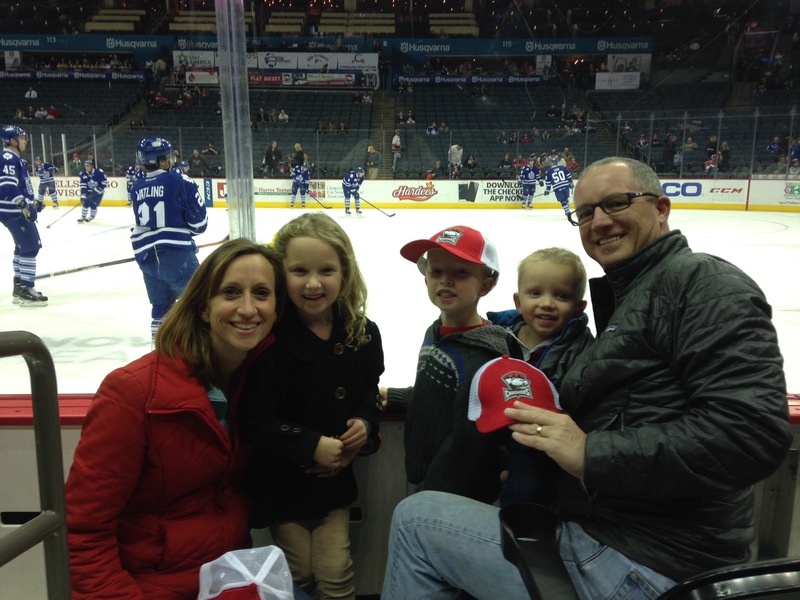 Since Wilson’s trip to the hockey game was such a success, we decided to take the whole family to a game. It didn’t hurt that they were having a special family night so that tickets were only $15 each and Miller was free. The best part was that the seats were fantastic! We were four rows from the ice and only a bit right of center ice. The kids also received a free Checkers hat to go along with it. It was a perfect family night out. I think the kids like watching the people, the cheerleaders (yes, believe it or not, but there ARE cheerleaders for hockey), the mascot, and eating popcorn better than actually watching the game. Tom and I watched some of the game, but mostly we spent time with our kids and each other. Our bottomless bowl of popcorn was refilled twice and was clearly the best purchase of the night. I am so glad that Tom encourages me to buy tickets to fun events for our family to enjoy together. Sometimes I am too frugal and don’t want to spend the money, but the time we spend together doing something new and exciting is worth the money. We could definitely spend it in worse ways. We arrived at the game while the teams were practicing and were able to get a family photo. Our seats were only three rows up from that! This entry was posted in Uncategorized and tagged checkers, hockey on January 17, 2015 by Becca. I feel like the house and our lives have been in total disarray since we returned home from vacation. The morning after we drove back into town from Christmas I unpacked the car with fervor because I had a feeling that I was going to be sick. I knew that I had a lot to get done before illness completely overtook me. I organized the new toys, took down Christmas decorations, and did laundry while Tom slept and let the kids do whatever they wanted. Now let me say that Tom was not sleeping just because he was tired, but he was sleeping because unbeknownst to us, he was getting the flu. Thankfully, that is not what I came down with – I only had a 12 hour stomach bug. I never thought that I would be thankful to ONLY throw up. No one else has gotten majorly sick, but the boys have both gotten pink eye, Wilson had a 12 hour fever, and Faith had a double ear infection. Faith never once complained about her ears hurting, but she hasn’t been able to hear for over a week. I finally took her back to the doctor yesterday so that she could get an antibiotic to clear up the infection that has begun behind her ear. Yes, we have had quite the infirmary around here over the last two weeks. We are still in the middle of remodeling the master bath so my bedroom has been covered in tools and dust for almost a month now. There should be great progress in the project this weekend and I am excited to see what it will look like after it is complete. It will be beautiful, I am sure. We are also scraping the ceiling in the hall downstairs since the popcorn was coming off anyway. The house is going to look great (other than the kitchen) when we try to sell it this spring. I am going to do everything that I want done in the next house BEFORE I move into it so that I can enjoy while I live there. Of course, everyone knows that I love a project and typically have three of them going on at the same time, so this is pretty standard fare for our house. So while I should be painting the bathrooms, I am instead working on a photo collage, cleaning out closets and putting together bookshelves. There is a big difference in “wanting” to do a project and “having” to do a project. So far, I have been working on the wants, not the haves. Despite the clutter, dirt and illness, we have been doing well as a family and I feel blessed to even have these problems of privilege. We have a beautiful house, money to remodel, and doctors available to us for medicine. I seriously can’t complain. This entry was posted in Uncategorized and tagged clutter, Sick on January 10, 2015 by Becca. Yesterday I got to spend the whole day with Wilson and Miller. Wilson really didn’t want to go to school so I let him skip since he was going to be leaving early anyway. It was so nice spending that time with the boys. I don’t usually get to spend that much time with just the two of them and I enjoyed it very much. 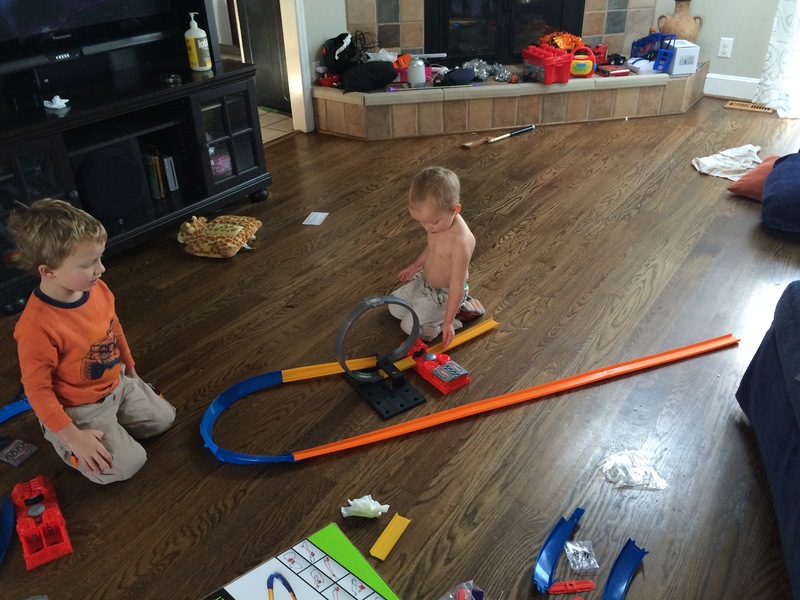 The first thing that we did was put part of their new race car track together. I say “part” because I didn’t have enough batteries and it was the most complicated race track I have ever seen! The boys loved it and they played so well together. I had scheduled a dentist appointment for both Wilson and Miller that morning. It was Millers first trip to the dentist. He was a bit nervous so Wilson held his hand while they walked back together. Wilson is a sweet big brother…most of the time. No cavities! Dr. Savage (funny name for a dentist, right?) 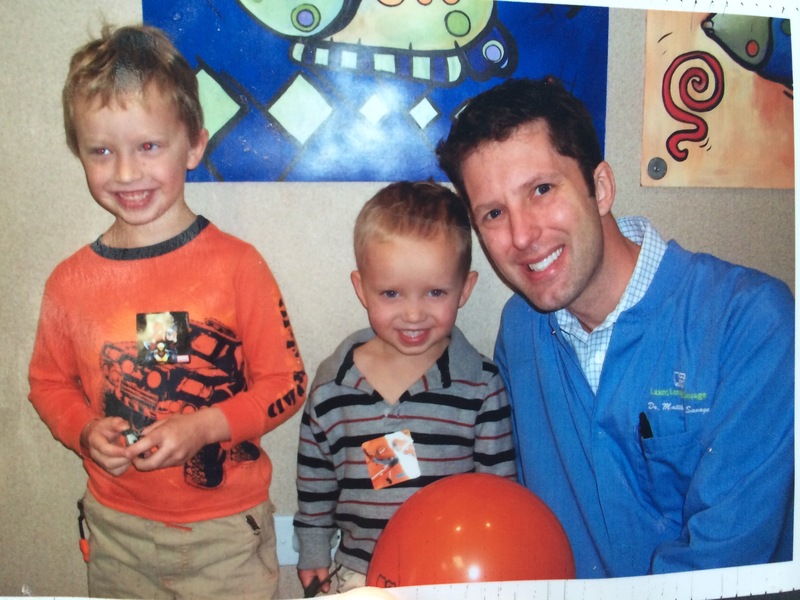 takes a picture with the kids at their first visit…. After the dentist we went to the playground, Wilson got a haircut, I bought myself a sweater, and we ran through the Walmart together in the fastest shopping trip ever! Finally, I picked up Faith and took all three of them to Wilson and Miller’s well check ups at the pediatricians office. I didn’t realize it at the time that I had scheduled both the dentist and the doctor on the same day. I thought it might have been too much but they did amazing! 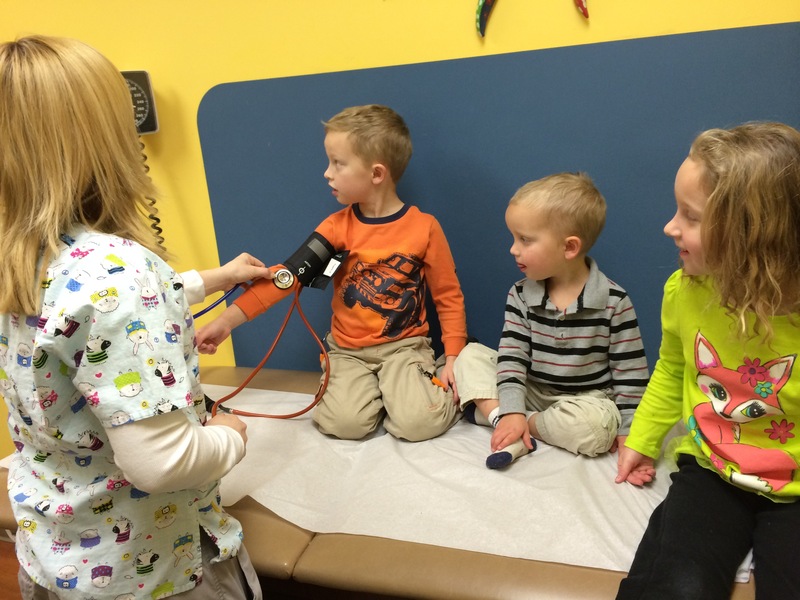 It was so cute to see all three kids up on the exam table…. Faith was there for moral support and she is a big help if one kid cries too much at the end during the shots. I had warned wilson that he would have to get one, maybe two, shots. It turned out that he needed two shots (I honestly thought that he would need more than that since I spaced out his shots when he was younger.) I gave him the choice: both shots now or one shot now and another shot later this year. He bravely took the option of two shots now and no more until he is eleven years old. He was very excited to hear that shots are in his past and will be for many years. Now Miller, on the other had, got one shot and had no idea that it was coming. I got him to turn his head away and the nurse stuck him. He rocked it! He didn’t even flinch. Wilson didn’t cry either. My brave boys!! Wilson is 42 inches and 42 pounds. Miller is 36 inches and 28 pounds. It was such a fun and enjoyable day with the kids. 85% of the time they are sweet brothers and sisters that truly enjoy each other’s company. I am so thankful that today was one of those days and that I got to enjoy it with them. 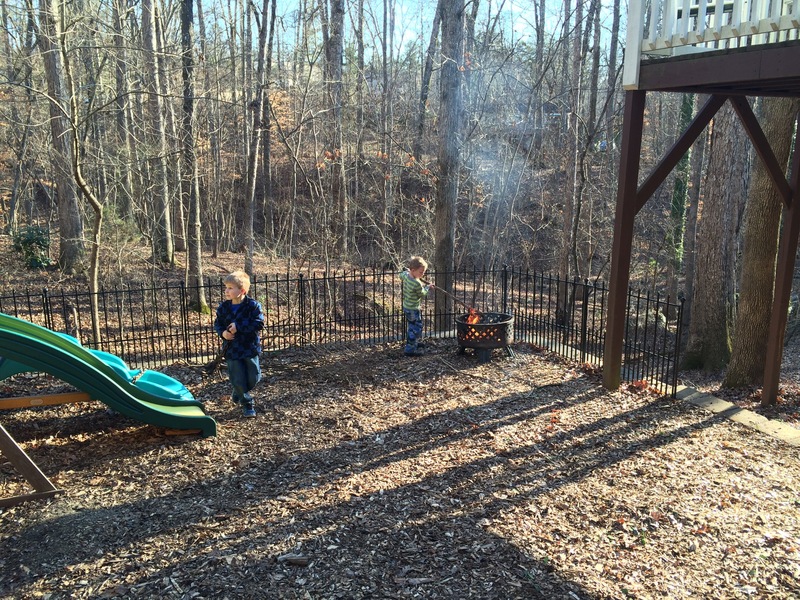 This entry was posted in Uncategorized and tagged Boys, Miller, wilson on January 7, 2015 by Becca. Once again we made our Christmas pilgrimage to Mechanicsburg, PA to visit Tom’s family. Tom’s two sisters were there with their significant others and their children. Over the past few years the family has grown into quite a large group. This is everyone (minus Dallas)…. 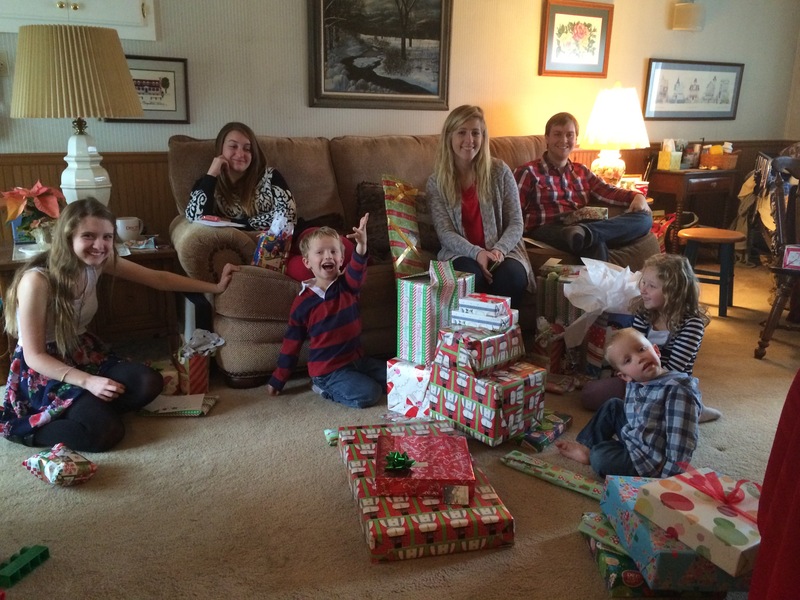 We even got a picture of Rebecca with all of the grandkids, new and old…. 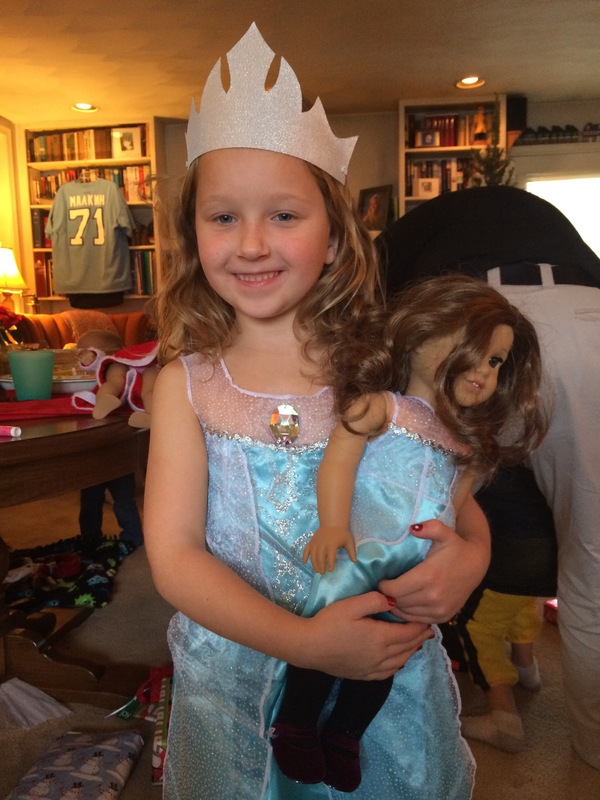 Faith had an American Girl Doll Christmas in PA as well. She got clothes for her and her dolls that match. Both of them are Elsa from Frozen…. One of the highlights of the trip, aside from the gifts, seeing family and the pool at the hotel, is our trip to Hershey Park/Chocolate World/Candy Lane. We ride the Chocolate World ride and then go outside to the park to ride all of the kiddie rides that they have opened for Candy Lane. 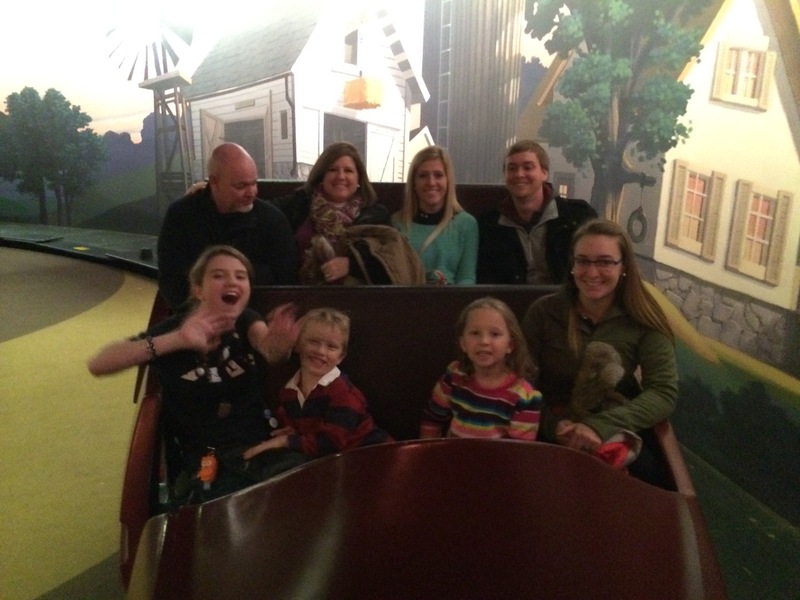 Here is half of the gang on the ride…. Miller and Alexis trying to be super tall…. For some reason, Miller is afraid of most of the rides. One ride he does love is the carousel. 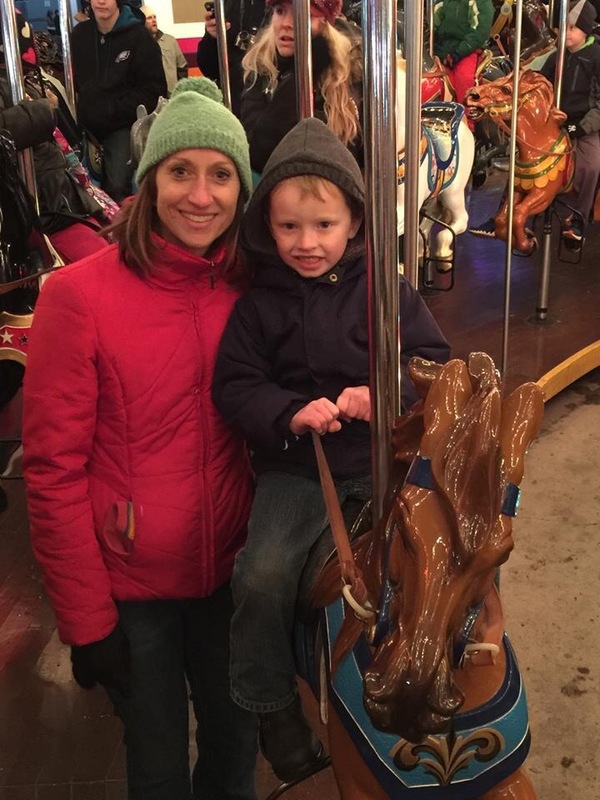 The whole group decided to ride the carousel together. It was quite a scene and lots of fun! Tom and I actually got a picture together! Unbelievable!! 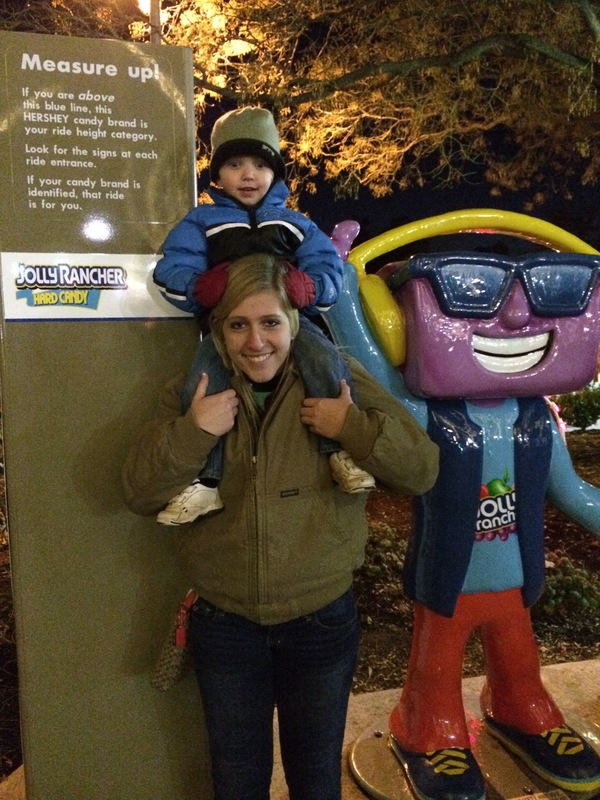 Gotta have the picture with the giant Hershey Bar…. 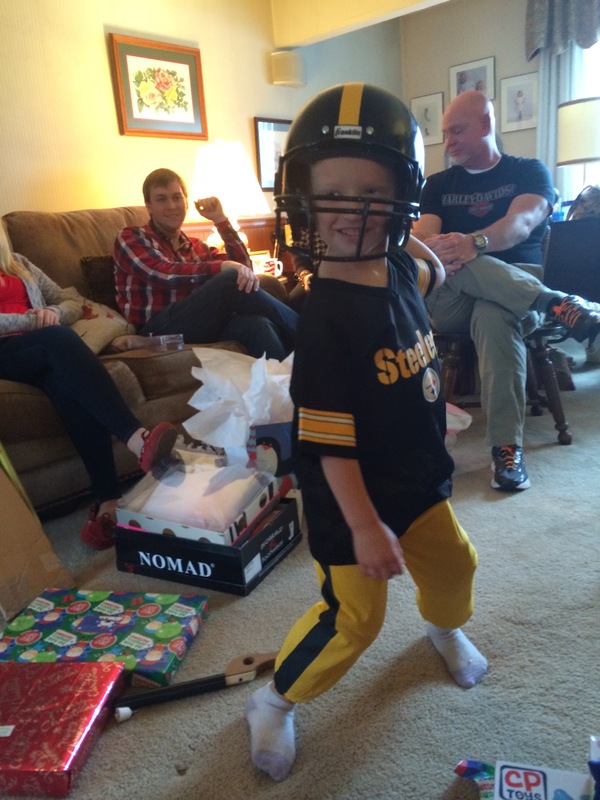 The kids love going to Pennsylvania to see their grandparents and cousins. It is nice to see them form these lasting bonds with family. When all else fails, there is always family. I have to say that this was one of our best trips up to PA and we look forward to going up there again this spring. This entry was posted in Uncategorized on January 2, 2015 by Becca.